Easter Egg Lollipop Shop info about the game-Games2Rule. You're running the most popular egg lollipop stand in a park for this Easter season. Bunnies started coming to the shop. Identify the desired item of the bunnies, which gets denoted for each bunnies. Prepare and serve the egg lollipop before the bunnies waiting time exceeds. If you have prepared the wrong item, throw it into the trash bin. 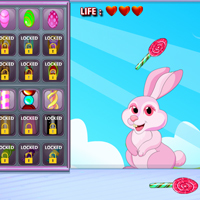 In each level, try to satisfy maximum bunnies and get the target points within the given time duration to proceed to tougher levels. Make sure you pick the right candy sticks and egg lollipop shapes. Enjoy!